Today my friends, you are in for a divine treat! 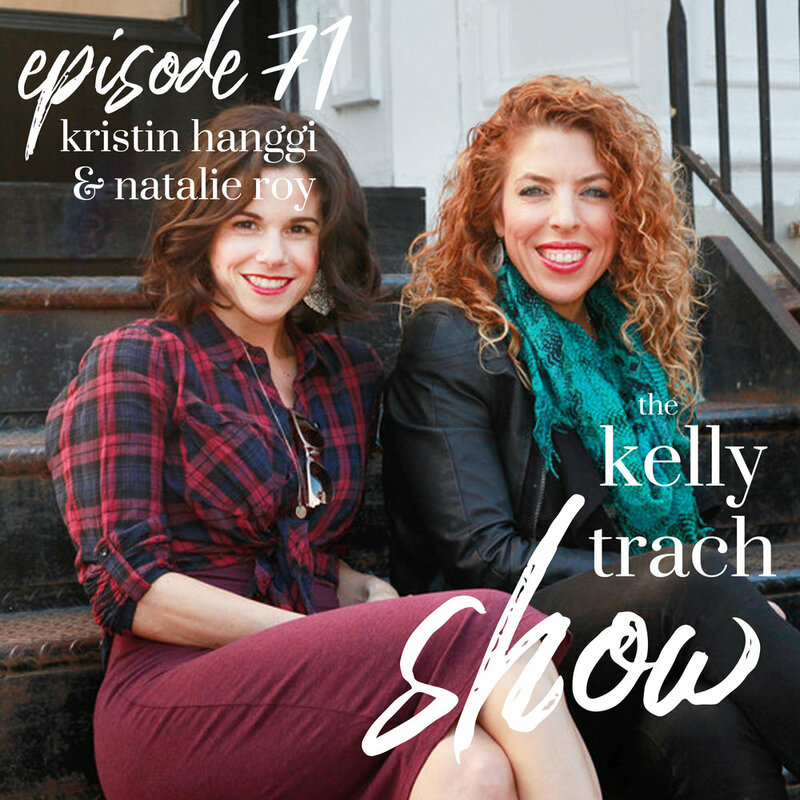 I'm obsessed with Kristin and Natalie's podcast and now they are here on the pod sharing their work with us. Kristin and Natalie are both true creatives living fully self-expressed. Natalie is and access, author, and spiritual teacher and Kristin is a director, writer, and a producer. Together, they co-founded The C.R.E.A.T.E. Series and teach how the universal laws work in our creative process, why pleasure and play are necessary, and sharing the metaphysical truth behind the pathway to your dreams. In this episode, we talk all about the creative process and how this is truly a spiritual practice. Doing your dharma means learning to dance with the muse, work with the universe, and practice a whole lot of faith, trust, and grace. Kristin and Natalie also touch on the art of surrendering and the fact that we're not in charge with our visions - the universe is and it's guiding us. Lastly, we talk about how when things get hard and the growing pains get real, it means that the creative process is working. And, that this is the time to rise because the universe is always working in your favor and is supporting your growth. This is such a fun episode and I hope you love it just as much as I did. So, come hang out with us for the hour! Natalie Roy is an actress, author and spiritual teacher. She's performed and taught all over the world on stage and screen and has appeared in The Affair, Law and Order: SVU, The Detour, Power, The Following, Being Erica, Murdoch Mysteries and in two films directed by award-winning director Sidney Furie. She authored her first book: "30 Years, 30 Lessons" several years ago and has since collaborated on The "I’mPossible Project" and the upcoming CREATE Book: “Let’s Play!” She’s also a 500 hour certified Yoga Teacher and a meditation teacher specializing in Visualization technique, positive psychology for actors, the Yoga Sutras and taking ancient Eastern philosophy and practices and playing them into the audition room and onto set. Natalie brings together the practices and techniques of meditation, mindfulness and “learned optimism” with the artistic process. She Co-Founded C.R.E.A.T.E with her best friend Kristin Hanggi! Kristin Hanggi's passion for connecting artists with holistic tools to develop and sustain their careers led her to co-found C.R.E.A.T.E. Workshops with her best friend Natalie Roy. Ms. Hanggi is a student and teacher of New Thought Ancient Wisdom Traditions, Mysticism, and Metaphysics. Kristin has studied with internationally-renown spiritual teacher, Michael Beckwith, and is especially interested in how Universal Laws help us with our creative lives to bring one’s dharma to the world. Ms. Hanggi is best known for directing and developing the smash-hit Rock of Ages, which received five Tony Award nominations, including a nomination for Best Direction of a Musical. She has directed numerous productions of Rock of Ages, including Broadway, the West End, Australia, Toronto, Las Vegas, and two National Tours. Ms. Hanggi's other stage productions include the developing and directing the acclaimed pop opera bare, which ran to sold-out audiences in Los Angeles and off-Broadway. bare brought Ms. Hanggi numerous accolades including the Ovation Award for Best Musical, LA Weekly Award for Best Musical, and the Robby Award for Best Director. bare has gone on to have over 100 productions all over the world. As a film director, Kristin has directed Naomi & Ely's No Kiss List, starring Victoria Justice; the indie Grantham & Rose starring Jake T. Austin and Marla Gibbs; and the hit book series, Dear Dumb Diary into a musical movie, under Executive Producer Jerry Zucker for Walden Media. Ms. Hanggi graduated with her Masters from USC after receiving her Bachelors from UCLA in Theater. In June of 2013, Kristin returned to her alma mater when she received the UCLA School of Theater, Film, & Television Distinguished Alumni Award. - How the act of creation is a spiritual practice. - Why the universe gave you your vision and how it's working with you to co-create it. - Why you can only take one step at a time, not just plan out your 10-year vision. - How to put pleasure first and why this is so important.